Khmer is a country in South East Asia. 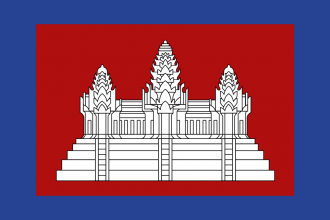 It is both the primary tag for the Khmer culture, and the only country with Khmer as its default primary culture. It is what remains of the once-mighty Khmer Empire. Khmer borders Ayutthaya to the West, Champa to the East, and Lan Xang to the North. It has sea borders with Pattani and Ligor to the south. While Khmer's state religion is Theravada Buddhism, most of its provinces are of a different religion, leaving it with only 2 Theravada provinces and thus low religious unity. Khmer begins with a core on Ayutthaya's province Battambang, giving it the reconquest Casus Belli. Khmer is one of the lesser powers in their area, and are usually gobbled up by Ayutthaya or another larger state, such as Lan Xang. While playing as Khmer, expansion is slow and measured. Once the player breaks the few surrounding nations though, the way to India is clear and they can begin to blob. Their national ideas are 50% trade/naval centred, and 50% general bonuses. The easiest target for Khmer is to the East- Champa. They are isolated enough and are Hindu in a sea of Buddhists so that they generally do not have much allies, and the player can easily conquer them alone. Ally as many nations as possible (the small states to the West are usually the only ones that ally Khmer), fabricate a claim on one of the provinces and invade. Remember to vassalize them, instead of conquering their provinces. This is because it will provide a larger overall army to Khmer, as individual states joined together will have a higher army limit overall (but make sure to keep liberty desire low through the use of Subject Interactions). They also have a core on Dai Viet's closest province, which allows the player to attack them too. The player should now survey the political landscape. Ayutthaya may try to expand South or North, perhaps gobbling up small states. Hopefully the player's allies discourage them from attacking them. Lan Xang doesn't do much, as they are surrounded by larger states- though they usually have too many allies to be possible to conquer just yet. This leaves two options: First, conquer the OPM South of Khmer's capital, Pattani. This will only be possible if the player can reasonably fight their allies/they don't have any. This brings up the important point of keeping an eye on all of the player's neighbours, even ones it isn't ready to conquer, such as Lan Xang, to see if they are weak and ready to be attacked. The other potential victim is Dai Viet. As they are isolated similarly enough to Champa (and, being Mahayana Buddhist, are heretics), they shouldn't have many allies. They aren't as big as Khmer either, so the player should be able to beat them in any war. Feed Champa some land, but keep in mind, Dai Viet has a national tradition of +50% coring cost for all provinces with a core of theirs, which also applies to diplomatic annexation. It is necessary to grow Champa large enough to be helpful in any wars, though, so feed them a good bit of Dai Viet. Now, is the waiting part of the campaign. Up until now, the player should be conquering and claiming lands quickly, so no large alliance blocs can form, but now is the time for settling lands and making sure to watch out for rebellions/unrest, as well as regain lost manpower. This is not to say that the player shouldn't be still keeping an eye on their nearby rivals, to see if they're losing any wars. If Ayutthaya is on the losing end of a war, jump in and crush them. The player should continue to watch out for weakness, especially in Malacca and the weaker Indonesian states, until they have an opportunity to strike. This is basically how the player will dominate their area. The player should be able to eclipse Ayutthaya and Lan Xang without even starting a war with them. Unless they were weak at one point, that is. In any case, when the player is definitely larger and stronger than these powers, try and take them on. After the player has conquered them/weakened them enough, they will be able to steamroll most states in their area. Be careful of annoying Ming (keep relations up with them) so they don't join any coalitions (if they don't collapse to rebellions early on), and begin to push into the small Indian states. Religious ideas/Humanist ideas: Buddhism is a good religion when it comes to Religious Unity, but it's not likely it will be where the player expands. The player can either go Humanism and not convert, or go Religious and turn everything a delightful orange (as well as getting the excellent Deus Vult CB).